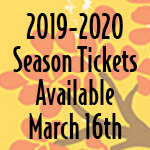 You may visit Spokane Civic Theatre’s website or purchase tickets directly from Spokane Civic Theatre Box Office without submitting any personally identifiable information. When you make a donation, purchase a subscription, or purchase tickets to any event Spokane Civic Theatre will ask you to provide personally identifiable information necessary to process and service your donation, subscription and/or ticket order that may include your name, billing and shipping postal addresses, telephone number, email address, and credit card number. When you make a donation, purchase a subscription or purchase tickets to any event through Spokane Civic Theatre, your credit card information will be run immediately and no credit card information will be stored or kept on file. We will retain the personally identifiable information you provided for our records and to facilitate customer service. Spokane Civic Theatre never shares with third parties any email address, physical address, name, or credit card number you provide when you make a donation, purchase a subscription or purchase tickets to any event by mail, in person, or on the telephone except as required by law. Spokane Civic Theatre regularly sends email newsletters to our registered email subscribers. Spokane Civic Theatre may also send email newsletters to customers and those individuals who have requested a brochure, purchased a subscription or purchased a ticket. Email recipients may always opt out of the email newsletters at any time by following the unsubscribe instructions included in the email message. Please review our ticketing policy here.